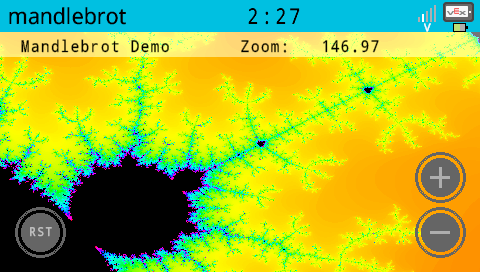 More fun with VEXcode and graphics. 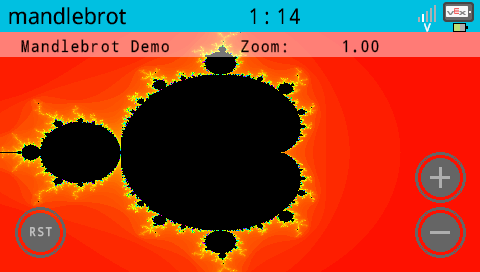 Another old program that I ported over to the latest VEXcode API, an interactive mandelbrot set demo. 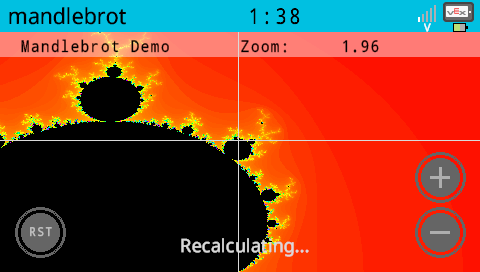 Use the + and - buttons to zoom the image (keep pressing to zoom continuously), after zooming it will recalculate at full resolution. touch the screen to recenter the image at the point touched. Use reset button to set everything back to the start. Here we are zoomed in a long way. It has no particular application to robotics, but it does show off the power of the V5 quite nicely. What IDE were these programs you keep porting initially written in?